Before we begin, some context is required. It is April 15 -- Jackie Robinson Day -- and only 231 of 2,430 regular season games have been played. That is 9.5 percent. There is still a lot of baseball to be played this season. A lot. That said, those 231 games count, and they will help shape the postseason races we follow in September. The old saying is you can't win a division in April, but you sure can lose one. Several contenders are off to sluggish starts this year and so are several star-caliber players. Chances are they'll get on track soon enough. Right now, it's a grind. With that in mind, here are four star players who have started slowly this season, listed alphabetically. These are core players their teams will need to produce and produce at a high level to stay in contention all year. Things have not gone well for the Rockies this season. Not at all. Even with Sunday's win (COL 4, SF 0), the Rockies are tied with the Marlins for the worst record in baseball at 4-12. Their 46 runs scored are the second fewest in baseball, better than only the Tigers (40), who've played one fewer game. Yes, there are a handful of players who have performed worse this season than Davis, who snapped his MLB record 54 at-bat hitless streak over the weekend. One of those players is Blackmon, who hasn't hit much and has struggled with the transition to right field. He had an especially brutal two-error game against the Dodgers two weeks ago. The Rockies are having a real hard time generating offense and it starts at the top of the lineup with Blackmon, the leadoff hitter. He has a .286 on-base percentage with only four extra-base hits (three doubles, one triple) and one stolen base through 15 games. Tough to score when the leadoff hitter isn't getting on base much or creating any havoc. Chances are Blackmon will never again steal 43 bases like he did in 2015 or swat 37 homers (and 86 extra-base hits) like he did in 2016, but he can be better than what he's been so far, and the Rockies will need him to turn things around soon to climb back into contention. Unlike the Rockies, the Mets are having little trouble scoring runs this season. They are second in the National League with 91 runs scored and they recently set a franchise record by scoring 6-plus runs in seven consecutive games. New York has won nine of their first 15 games this year. In Cano's case, he was traded to a new league over the winter, so he's still trying to get himself situated in the National League after spending his entire career in the American League. New pitchers, unfamiliar ballparks, so on and so forth. At the same time, Cano is 36 years old now, an age where age-related decline is possible if not expected. Especially for a second baseman. Cano has defied the typical second base aging curve for several years now -- Hall of Fame second baseman Roberto Alomar was done as an above-average hitter at age 34, for example -- but that isn't going to last forever. Chances are this is early-season small sample size weirdness. You never really know though. Even on Opening Day, when he twirled six innings of one-run ball against the Braves, it was clear Phillies ace Aaron Nola was not quite right. He walked career-high five batters that day and had to battle for each out. Ouch! Nola allowed eight home runs in his first 27 starts and 176 innings last season. He's allowed 14 homers in nine starts and 51 2/3 innings since. Nola's awesome, don't get me wrong, but he had a 0.41 HR/9 through 27 starts this season, and that is damn near impossible to sustain in this home run happy era, especially when you call cozy Citizens Bank Park home. Some home run regression was inevitable and wow has it been harsh. As good as they looked on paper, the Phillies did come into the season with some questions in their rotation. 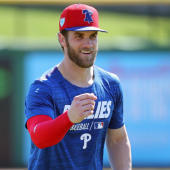 Could Jake Arrieta rebound in 2019? Could Zach Eflin and Nick Pivetta build on their 2018 seasons? Would Vince Velasquez have that long-awaited breakout? Nola was supposed to be manager Gabe Kapler's rock. The guy he'd send to the mound every fifth day with no worries. In the early going though, it's been a struggle for Nola, especially with the long ball. Even with Nola's homeritis, the Phillies have won nine of their first 14 games, and they currently sit atop the NL East. They begin an important three-game series -- important by mid-April standards, that is -- with the Mets at home Monday night. After slashing roughly $15 million off their Opening Day payroll over the winter, the Indians started the season shorthanded. Franchise cornerstone Francisco Lindor has been out with calf and ankle injuries, and Jason Kipnis returns Monday from a calf problem that sidelined him since spring training. Offense has been hard to come by this year (only 52 runs), though the Indians are 8-7 through 15 games. It could be worst. That does not include his 0 for 11 showing in the three-game ALDS last year either. Adjusted for ballpark, Ramirez has been 54 percent worse than the league average hitter since August 15 of last year, which is admitted an arbitrary, cherry-picked date, but still. Ramirez is over 200 plate appearances (240 to be exact) of well-below-average production. It is stunning that a player as good as Ramirez -- he hit .270/.387/.553 with 39 homers last season even while slumping those last 40 games -- can hit this poorly for such a long stretch of time. Two-hundred-and-forty plate appearances is more than one-third of a season, give or take. It is sort of amazing the Indians are a game over .500 with Lindor and Kipnis on the shelf and Ramirez bring a non-factor. Something has to give. Cleveland needs Ramirez to figure it out and soon.